Are we really adults as we go about bad mouthing, expressing hate, and dissing on each and every move our political leaders make? Why it is families are fair game now? Is there anything that either side can endure about the other today? Can we compromise on anything that comes from a differing ideology? We teach our children good manners asking them to be appreciative and express themselves with gratitude. Suggest that we don’t tolerate rudeness letting them know in is never acceptable to lash out at another person. Offer that their greatest asset in life will be to become a good listener. Share that life has rules and set boundaries for them where they learn the consequences of decisions. Encourage open-mindedness so the diversity of life can be expressed through varying life experiences. And impart the value of showing respect to elders and those who hold important positions. Certainly- as this is done we teach them how to think for themselves, create, and find ways to improve the world. That is normal, our thoughts are to enable greatness and build opportunity as this new generation grows into adulthood and leads those who will follow them. Yet our supposedly adult eyes are closed and ears covered to anything the other side does or says. It seems we stand on platforms of acceptance holding out welcoming hands to all types of diversity; except ideological! What is absurd to me is that we know example is the best teacher. Our education systems are filled with appropriate methods to enable desired outcomes and further learning which is occurring naturally at home. But, what is a child to think when they see how the “adults” of the world destroy any learning that has occurred? Imagine what it would be like for them to learn critical life skills to then see that they mean nothing in the real world today. 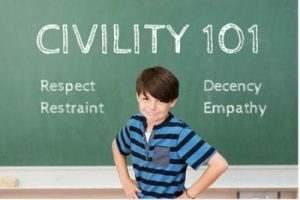 This entry was posted in Leadership and tagged childish behavior, civility, example, ideology, incivility. Bookmark the permalink.